If you like fresh-roasted coffee (and who doesn’t? ), you know you’re going to get what you want when you walk into any Trees Organic Coffee & Roasting House location. Fresh-roasted coffee just tastes better… and we aim to please. Coffee Beans Don’t Stay Fresh Forever. Use ’em or lose ’em! 15 months to roast green beans. Yeah, they last for a while, but not forever. 15 days to grind the roasted beans. Two weeks… and every day, they lose just a little bit of their magic, so don’t leave it to that 15th day! (Dark-roasted beans also lose their flavor quicker — 12 days if you’re lucky). 15 minutes to serve fresh-brewed coffee. Best to serve it as soon as it’s ready. Leaving the same batch of coffee out all day is not an option. Don’t bother re-heating it — do yourself a favor and brew up a new batch. 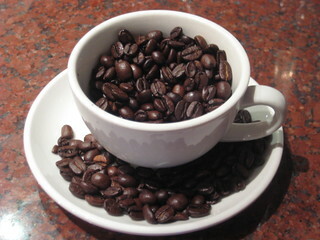 Keep your beans in an airtight container (preferably with a one-way valve) to help seal in that fresh coffee taste. Keep the stored coffee at room temperature — extreme cold can impact the flavor because the oils start to break down. The holiday gift-giving season is upon us and you may be thinking “maybe I should get a present that I know they will actually use?” A Trees Organic gift card is the perfect purchase for your favorite coffee-drinking, cheesecake-eating, cafe-aficionado loved one, friend or co-worker.